Mr. Morsi, in a carefully worded rebuke insisted he was the commander in chief and that the army's role was solely to protect the country's borders. Amid wild speculation of what the military may do, much rides on whether the protesters, who see this weekend’s demonstration as a launching pad for a second revolution, succeed in mobilizing large numbers and whether events and to what degree they turn violent. James M. Dorsey is a senior fellow at the S. Rajaratnam School of International Studies, co-director of the University of Würzburg’s Institute of Fan Culture, and the author of The Turbulent World of Middle East Soccer blog. Transition in Qatar: Will he or won’t he? Conventional wisdom predicts that 33-year old Sheikh Tamim bin Hamad Al Thani will adhere to his father’s use of sports as a key foreign, defense and security policy tool to embed Qatar in the international community. Experts and pundits suggest that Sheikh Tamim at best will nibble at the fringe of his father’s at times bold policies by expanding the government’s focus on domestic issues. No doubt, Sheikh Tamim has demonstrated his interest in sports as head of the Qatar Olympic Committee and by creating Qatar National Sports Day, a popular annual event on February 14. That move coupled with his chairing of the Supreme Education Council lies at the core of the suggestion that he will focus not only on the emirate’s regional and global projection but also on his country’s domestic affairs. As always, the devil is in the detail. No doubt, outgoing emir Sheikh Hamad bin Khalifa Al Thani will be remembered as a visionary who put his tiny country on the world map, changed the Middle East and North Africa’s media landscape with the creation of the Al Jazeera television network, offered the Gulf an alternative vision of leadership by stepping aside to make place for a younger generation and turned Qatar into a nation with the world’s highest income per capita of the population. Few Qataris will question the achievements of Sheikh Hamad, who on Tuesday handed over power to his son, a virtually unprecedented step in a region in which rulers hang on to power untill death even if they at times have experienced a deterioration of health that has incapacitated them not only physically but also mentally. A wave of demand of change sweeping the Middle East and North Africa only serves to highlight the significance of Sheikh Hamad’s move. “The time has come to turn a new leaf where a new generation steps forward… Our young men have proven over the past years that they are a people of resolve,” Sheikh Hamad said in a nationally televised address. n Potential tacit concessions Qatar may have to make to non-Muslim soccer fans during the World Cup, including expanded areas where consumption of alcohol will be allowed, public rowdiness and dress codes largely unseen in the Gulf state, and the presence of gays. 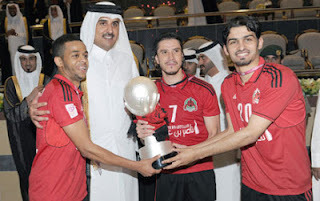 A discussion in Qatar about possibly transferring ownership of soccer clubs from prominent Qataris, including members of the ruling family, to publicly held companies because of lack of Qatari interest in “the sheikh’s club” illustrates a degree of sensitivity to popular criticism. Much of the criticism of Sheikh Hamad’s policies have been quietly supported by Saudi Arabia whose relation with Sheikh Hamad, who came to power in a bloodless coup in 1995, has more often than not been troubled. Sheikh Tamim could well bring a different tone to Saudi-Qatari relations. Since the eruption of the crisis in Syria, Sheikh Tamim has been the point man in coordinating policies with the kingdom and instead of the emir greeted guests as they arrived in March for an Arab summit in Doha. “Sheikh Tamim will not rock the boat. He is well-versed and immersed in Qatari vision and policy. He understands the importance to Qatar of sports. At most, he will be more publicly embracing of traditionalism in what remains at the bottom line a conservative society,” said a Qatari with an inside track. The soccer matches and mounting tension in advance of the protest are likely to be seen by militant, highly politicized, violence-prone and street battle-hardened soccer fans as an opportunity to demonstrate their sustained mettle and resolve. The fans, one of Egypt’s largest civic groups, played a key role in the toppling two years ago of President Hosni Mubarak 2.5 years ago and opposition to the military and the Muslim Brotherhood-led government since. Concern about clashes at the matches and the protest has also sparked debate within the security forces and the military, who are widely held responsible for the deaths of some 900 protesters since the ousting of Mr. Mubarak, on how to deal with potential soccer-related violence as well as the planned protest. The interior ministry, which controls the police and security forces, initially opposed allowing Egyptian league matches to proceed because of threats by soccer fans to storm stadiums in protest against a ban on spectators. The ministry feared that clashes with fans would add to already mounting tension in advance of June 30. In an about face however, the ministry late this week said it would permit the games to be played on Saturday and Sunday instead of on Thursday and Friday as originally scheduled. Security forces are nevertheless bracing for renewed clashes with fans that in the past two years have left thousands injured and scores dead. Fans have been largely banned from matches ever since the league resumed in February after a year-long suspension in the wake of the deaths of 74 supporters last year in a politically loaded brawl in Port Said. "We are giving you 48 hours; we are giving you a chance to stop suppressing and provoking us. 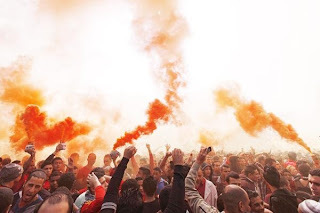 Either we return to the stands or … you will know what will happen soon,” the Ultras White Knights (UWK), the militant support group of storied Cairo club Al Zamalek SC, warned this week in a statement. Mr. Morsi’s Brotherhood spotlighted the importance of soccer and the role of the militant fans in football-crazy Egypt earlier this month by announcing that it would field candidates for the board elections of Zamalek and other major football teams in what many see as a bid to control the politically significant sport. Attempts by soccer fans to gain access to stadiums this weekend could be a foretaste of what may happen on June 30, the first anniversary of Mohammed Morsi’s inauguration as Egypt’s first freely-elected post-revolt leader. 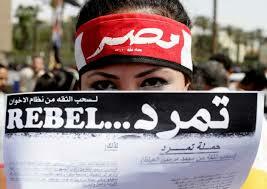 Ad hoc group Tamarud (Rebel) hopes to commemorate his anniversary with a million-man march on the presidential palace. Tamarud has reportedly collected 15 million signatures, two million more than the 13 million votes the president garnered a year ago, on a petition demanding Mr. Morsi’s resignation and new elections. The petition that a significant number of militant soccer fans are believed to have signed, takes Mr. Morsi to task for his failure to tackle the country’s economic crisis, dispel fears that he is pursuing an Islamist agenda, and his haughty style of government that many see as a continuation of Mubarak’s authoritarianism. It calls on the military and the judiciary in violation of the constitution to lead the country to new elections. Youth groups and soccer fans see Tamarud’s mobilization success and the June 30 march as an opportunity to reinvigorate their movement and launch a second revolution. Fears of violence have been fuelled by attacks by Morsi supporters on Tamarud representatives as they publicly collected signatures on street corners and other public spaces. 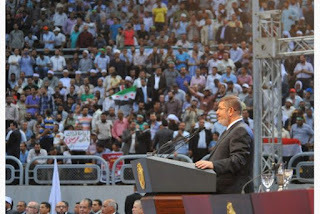 Supporters and opponents of Mr. Morsi clashed for hours last week in the Mediterranean city of Alexandria. To ensure the authenticity of its petition, Tamarud has insisted that signatories identify themselves and register their identity document. Irrespective of whether or not the soccer matches and the June 30 march produce the kind of violence that could shift Egypt’s political paradigm, they indicate just how deeply divided Egypt is and the degree of lack of confidence in Mr. Morsi among a significant segment of the population. Concern that violence could prevail was reinforced by some Islamist groups calling for counter demonstrations on June 30 as well as the expectation that soccer fans and the Black Bloc, a vigilante group founded by militant soccer enthusiasts, will act as a protective and potentially provocative force during the anti-government march. Attempts by cooler heads within Mr. Morsi’s Muslim Brotherhood and other Islamist groups to avert what could prove to be a game-changing outpour of anger against the government by reaching out to opposition groups have so far failed. The mounting tension has further thrown the spotlight on Mr. Morsi’s troubled relationship with the security forces witness the interior ministry’s dithering on the soccer matches as well as an initial statement that police would stay away from the Tamarud demonstration that was later withdrawn. Security officials fear that the police, which is widely despised because of its enforcement of repression in the Mubarak era and its subsequent at times deadly clashes with protesters, will be seen as being supportive of a Morsi government it distrusts if it comes to clashes with protesters this weekend and on June 30. Hossam Ghali, the captain of crowned Zamalek rival Al Ahli SC, reflected Egyptians’ worries about where there country is heading by deciding this week to postpone a decision on whether to extend his contract until after the June 30 march. "I'm now considering leaving Egypt because of the ongoing political turmoil, which is seriously affecting Egyptian football. It will be difficult to continue in Egypt under such circumstances," Al Ahli’s website quoted him as saying. Khamenei’s apparent move to avert a popular uprising. conciliatory approach with the West. that the slate of candidates was geared towards a conservative and loyalist victory. uprising of 2009 that was driven by widespread belief of a fraudulent election. and the candidate with the greatest promise of reform emerged on top. just to prevent him from winning. Guards in public life by calling for an end to political interference in sports. outspoken critic of the reform movement and social liberalisation. leader was increasingly at odds. women stormed Tehran’s Azadi stadium. certain to project a very different image to the outside world from that of Ahmadinejad. Zamalek coach Jorvan Vieira warned last month that “despite not getting their salaries, the players do their best in the matches. The management must solve the problem as I can't ask them to play while they are losing their concentration." While Mr. Morsi’s breaking off of relations with Syria strikes a popular cord among Egyptians who are largely abhorred by Mr. Al-Assad’s brutal crackdown on his opponents, his attempt to gain control of soccer clubs risks backfiring against the backdrop of mounting calls for his resignation. Islamists hardly endeared themselves to soccer fans by recently suggesting that their rivalries were a Zionist plot to destabilize Egypt. Al Hafiz TV, a Salafi television station critical of Morsi that promotes a return to the 7th century lifestyle of the Prophet Muhammad and his immediate successors made the insinuation by airing a video portraying an alleged ultra-Orthodox Jew as advocating the instigation of strife between various groups in Egypt, including soccer fans. Gamal Abdallah, a member of the Brotherhood’s sports committee, announced the movement’s intention to gain control of clubs on the website of the group's political arm, the Freedom and Justice Party. "The group is considering fielding candidates or endorsing certain contenders in some posts during Zamalek's board of directors election… The group also intends to take part in all club elections in the coming period," Mr. Abdallah said. The Brotherhood is likely to back Mortada Mansour, a lawyer and Brotherhood supporter, who is challenging incumbent Zamalek chairman Mamdouh Abbas, a wealthy businessman, in elections scheduled for September. Militant Zamalek fans last month interrupted a news conference by sports minister El-Amry Farouk intended to announce new regulations for clubs and unveil his development plans because of his dismissal of Mr. Abbas and imposition of a temporary board in advance of the September elections. The fans have since demonstrated and blocked roads to demand the release of militants detained during the storming of the minister’s conference. With four days left in the run-up to Iran’ presidential election, Supreme Leader Sayed Ali Khamenei has more to worry about than ensuring that a sufficiently malleable candidate emerges as winner. A crucial victory on Tuesday in Iran’s 2014 World Cup qualifier could bring thousands into the streets in celebrations that have in the past turned into anti-government protests. The risks mount if none of the eight presidential candidates wins 50 percent. A second round on June 21 would follow on the heels of the Iranian national team’s final qualifier against South Korea on June 18. An Iranian victory in that game would provide Iranians two opportunities to celebrate: on match day and when the victorious team returns to Tehran shortly thereafter. If the past is any yardstick, World Cup soccer victories are volatile moments in Iran. This time round, a soccer victory could prove to be particularly volatile. Discontent in the Islamic republic is bubbling at the service. While the elections as a result of the disqualification of former president Ali Akbar Rafsanjani, who is seen as a reformer, are less likely to provoke mass protests as they did in 2009 against a poll that was perceived to have fraudulently returned President Mahmoud Ahmadinejad to a second term in office, soccer could provide the spark. The strength of a desire for change among a significant segment of the public is reflected in the emergence of Hassan Rohani, a cleric who was Iran’s chief nuclear negotiator in the early 2000s, as a reformer and potential frontrunner. The importance of sports in general and soccer in particular is highlighted by the fact that political interference has become an important theme in the election campaign. Presidential candidate and former foreign minister Ali Akbar Velayati vowed in one of three televised debates among the candidates that he would ensure that sports management is shielded from interference by the government and the Revolutionary Guards by returning it to professionals. By the same token, Tehran Mayor Mohammad Baker Qalibaf, widely viewed as a conservative, prepared for his candidacy by using his municipality and its bank to sponsor clubs. Mr. Qalibaf’s move is in line with the growing influence of the Revolutionary Guards and other security officials in the management of the country’s major soccer clubs by either taking over ownership or ensuring that they play an influential role in management. This includes clubs like Persepolis, Iran’s most popular club that has its roots in the left and historically catered to Iran’s lower social classes, and Traktor Sazi. Based in Tabriz, the capital of the predominantly Azeri province of Eastern Azerbaijan, Traktor Sazi has emerged as a symbol of an Azeri national identity. Its stadium has been the scene of environmental and nationalist protests in recent years. The potential of World Cup qualifiers to create opportunity for protest in Iran was demonstrated in 1997, 1998, 2002 and 2006. When Iran’s 1997 victory against Australia qualified it for the first time in two decades for the World Cup finals, public celebrations quickly turned into protests. They erupted barely a month after the election of Mohammed Khatami as president held out the promise of a less restricted society. Men and women honked their car horns, waved Iranian flags and danced in the streets together to blacklisted music and sang nationalist songs as they did six months later when Iran defeated the United States. Some chanted, “Death to the Mullahs.” Some 5,000 women stormed Teheran’s Azadi stadium where the team was being welcomed in protest against their banning from attending soccer matches in defiance of calls in the media for them to watch the ceremony on television at home. Bahrain’s defeat of Iran four years later in a World Cup qualifier sparked mass protests against a backdrop of mounting disappointment with Mr. Khatami’s failure to implement change. Shouting anti-government slogans, soccer fans attacked banks and public offices and clashed with security forces. Khatami’s younger brother, the then deputy speaker of parliament, warned that the protests reflected popular frustration with unemployment and low standards of living and a rejection of the regime’s “excessive interference in people’s private lives.” The protests ignited heated debate in parliament and on the pitch about where the Islamic republic was heading. Mr. Ahmadinejad, a player and fan, who was at the forefront of increased Revolutionary Guard influence in soccer in a bid to use soccer’s popularity to enhance his image, visited the Iranian national team in advance of the match against Lebanon. Unable to run for a third term and having failed to position a presidential candidate close to him, Mr. Ahmadinejad is concerned about his legacy and the possibility of charges of corruption and economic mismanagement once he no longer enjoys immunity. Lebanon’s national team coach, German-born Theo Buecker, holds out little hope for Mr. Khamenei’s ability to avoid potential soccer-related protest. He notes that Iran has to win on Tuesday. The match “is not important for us,” he says, adding that he is not able to field some of his top players because they were suspended in a match-fixing scandal. That raises the likelihood of celebrations and increases the risk of protests on the eve of the presidential election. There is a lesson to be learnt from this year’s Formula One public relations disaster in Bahrain, trade union pressure on Qatar, controversy over Israel’s hosting of the FIFA Under-21 finals, last year’s successful International Olympic Committee (IOC) campaign that forced three reluctant Muslim nations to field for the first time women athletes at a global sporting event and the recent election of a Bahraini soccer executive as president of the troubled Asian Football Confederation : mega-events and campaigning for office in international sports associations empower activists and put nations at risk of reputational damage. Formula One boss Bernie Ecclestone acknowledged as much saying in April that Bahrain had been “stupid” to allow the Grand Prix to go ahead because it gave a platform to thousands demonstrating against perceived autocratic rule and lack of rights. Mr. Ecclestone’s criticism didn’t stop him however from expressing willingness to extend his contract with Bahrain for another five years until 2021. Nevertheless, Mr. Ecclestone’s comment highlighted the fact that mega events and public office are double-edged swords. They potentially allow countries to showcase themselves, polish or improve a nation’s international and a government’s domestic image, serve as tools to enhance soft power and create commercial, economic and political opportunity. That is if host nations of mega-events and office holders and their home countries understand that winning the right to organize a major tournament or an association election puts on display not just their best side but also their warts and at times even existential problems. That empowers activists, spotlights their demands amid intense media focus and gives them the moral high ground if a country fails to respond adequately in word and deed. The lesson learnt from recent experiences in the Middle East is that mega events and public office give not only countries and governments leverage but also their detractors. For two years running, Bahrain’s Grand Prix backfired with protesters dominating news coverage. The image that emerged in television pictures and independent reporting of thousands protesting was not one of an island state that has put a squashed popular uprising in 2011 behind it, but one of a nation wracked by continued strife to which the government responds with force. Sheikh Salman’s legalistic argument that football and politics are separate and that he had not violated FIFA or AFC rules rather than addressing the larger moral issues involved has resulted in persistent media questioning, activist calls for his disqualification and a reinforcement of the Bahraini government’s image as repressive and uncompromising. Rather than categorically refusing to address the issue, Bahrain and Sheikh Salman, although restricted by being a member of a royal family that is dominated by hard liners, would have been better served by allowing the government’s own inquiry into the suppression of the revolt that admitted to wrongdoing by security forces, including torture, to shape his response and deflate the criticism. Similarly, neither Israel nor Saudi Arabia have succeeded in turning the tide of public opinion or at least establishing a degree of equity in perception. To be fair, Saudi Arabia, which grudgingly allowed a few underperforming expatriate Saudi women to represent it at the 2012 London Olympics, left the field to its critics by effectively refraining from engagement in the debate about severe restrictions imposed on women in the kingdom. In doing so, it failed to leverage assets it could have deployed to moderate perceptions, including the economic clout of women in the kingdom as a result of rights enshrined in Islamic law, moves to authorize physical education in private schools, the re-emergence of women’s health clubs, plans to license for the first time women’s soccer clubs that currently operate in a legal nether land and last year’s unprecedented election of a commoner as head of the Saudi Arabian Football Federation to replace an appointed royal. Similarly, a video on You Tube features Palestinian youth in a village near the wall separating Israel from the West Bank tearing off their FC Barcelona jerseys, hanging them over razor wire the Israeli military erected around the village and setting them on fire. The protest was part of a campaign protesting Israel’s hosting in June of the U-21 championship finals intended to counter Israel’s increasingly tarnished image as the obstacle to settling its long standing dispute with the Palestinians, growing objections to Israeli policies perceived as intentionally making daily life difficult for West Bank residents and its ever greater integration into European soccer. Israel is part of UEFA rather than Asia because of Arab refusal to play Israeli teams as long as a peace settlement has not been achieved. The U-21 is the most important tournament Israel has ever hosted and comes at a time that Israel has lost significant ground in the global battle for hearts and minds. A hunger strike last year by a Palestinian national soccer team player who was suspected of association with a militant group, Islamic Jihad, but never charged proved to be costly in the global soccer world. The player was released under pressure from FIFA, UEFA and FIFPro, the global players’ organization amid fears that he would die as a result of his hunger strike. 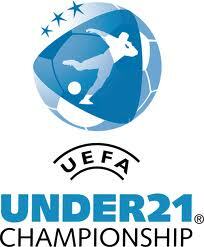 "Football is an effective vehicle for Israel to rehabilitate its image with the international community. A large sporting event is an ideal opportunity for Israel to present itself as a normal country," Tamir Sorek, a University of Florida expert on Israeli soccer told UAE newspaper, The National. With foreign workers constituting a majority of the population and at least half a million more expected to swell their ranks to work on World Cup-related infrastructure projects, Qatar has moved to improve material working and living conditions and the 2022 organizing committee has issued a charter of workers’ rights. The moves fall short of union demands for the creation of independent workers’ organizations and collective bargaining and despite talks with labor ministry officials has put the two on a collision course with the International Trade Union Confederation (ITUC) demanding that world soccer body FIFA deprive Qatar of its hosting rights. If reputational damage and failure to achieve a key goal is a host nation’s primary risk, activists may see achieving that as a moral victory. Similarly, they are likely to claim any progress such as an improvement of workers’ material labor and living condition as a success even if they were unable to meet their ultimate goal. Underlying their inability, however is the fact that in taking on Bahrain, Qatar, Saudi Arabia and Israel they were addressing issues perceived by government to effect national security if not their nation’s very existence. That inability highlights limitations to their power and the uphill battle of sparking a meaningful broad-based global campaign like the sports boycott of South Africa that ultimately was effective only because it exploited a willingness in the international community to confront apartheid. The international community has proven so far to have little appetite for paying more than lip service to workers’ rights in the Gulf, women’s rights in Saudi Arabia or Israeli policies towards the Palestinians. At the bottom line, the message for host countries is: mega events constitute a platform for showcasing both a country’s positive aspects as well as its warts. The question potential hosts have to ask themselves is what price are they willing to pay in terms of reputational risk if they are not willing or able to address their vulnerabilities. That question is all the more acute as international sports bodies like FIFA are under pressure to make human, labor and women’s rights part of the criteria for awarding events. In doing so, they are likely to raise the barrier for a country’s chance of gaining the opportunity to host a major event. For activists, the message is one of empowerment but empowerment that comes with the responsibility to employ it effectively. The trade union’s battle with Qatar over labor rights is likely to become a case study. With nine years to go until the World Cup, the question is whether ITUC played its trump card too early by already asking FIFA to deprive Qatar of the World Cup. “What happens to the workers if Qatar loses the World Cup? The ITUC loses its bargaining chip. Moreover, they are campaigning for taking away the World Cup even before the bids for construction of stadiums have been awarded. Qatar’s construction boom will continue with or without the World Cup. Even if they lose those workers, others will come. It’s the market’s push and pull factor. If the Nepalese don’t come, the Bangladeshis will. If the Bangladeshis don’t come, the Vietnamese will and if the Vietnamese don’t come, the Chinese will,” said an independent labor analyst. If there is one lesson Turkish Prime Minister Recep Tayyip Erdogan should have drawn from the popular revolts that toppled four Arab leaders and sparked civil war in Syria in the last two years, it is that police brutality strengthens protesters’ resolve and particualrly that of militant, street battle-hardened soccer fans. In a replay of events on Cairo’s Tahrir Square that toppled Egyptian president Hosni Mubarak, thousands of fans took up positions, erected barricades, counterattacked the police and threw tear gas cannisters straight back into the ranks of law enforcement. “It was a critical moment. Supporters of all the big teams united for the first time against police violence. They were more experienced than the protesters, they fight them regulalrly. Their entry raised the protesters’ morale and they played a leading role,” Bagis Erten, a sports reporter for Eurosport Turkey and NTVSpor said. What started out as an effort to save trees has mushroomed into the most serious challenge to Mr. Erdogan’s decade in government that intially was marked by serious democratic reform, significant economic growth and Turkey’s emergence as a regional powerhouse. Mr. Erdogan is Turkey’s first prime minister in decades to have swept three elections with enough votes to form a one-party government. What is emerging is that there are four apparent parties to the current crisis in Turkey: the secularists, Mr. Erdogan’s Islamists, the police and the military. Mr. Erdogan’s Islamist rival Fethullah Gulen, a powerful, self-exiled, Pennsylvania-based cleric, who wields influence in the police may well have seen the protests as an opportunity to undermine the prime minister. Mr. Erdogan’s party colleague, President Abdullah Gul, is viewed as close to Mr. Gulen. In a veiled reference to Mr. Erdogan, Mr. Gulen recently preached against hubris. For their part, reports circulating in Istanbul say that the military, which shares secularist suspicisions, has refused police requests for help and that a military hospital had even handed out gas masks to protesters. The ball is in Mr. Erdogan’s court. Restraining his police and saving trees on Taksim are unlikely to do the trick. Mr. Erdogan will have to re-build bridges and demonstrate that he listens to those who elected him as well as those that didn’t by among other things pursuing an agenda that is inclusive rather than overtly Islamist. Almost a week of countrywide protests in Turkey have left an indelible mark on the country’s political landscape: broad discontent with the policies of Prime Minister Recep Tayyip Erdogan’s policies and increasing haughtiness bubbled to the surface; militant soccer fans thousands of whom joined the Taksim Square protests united and were politicized; and the role police force plays in solidifying opposition groups and resolve was highlighted. Mr. Erdogan’s intransigence and hard-handed police attempts to suppress the protest with tear gas and water cannons swelled the ranks of the demonstrators and turned a demand for perseverance of a 75-year old Istanbul park into a massive call for the prime minister’s resignation. 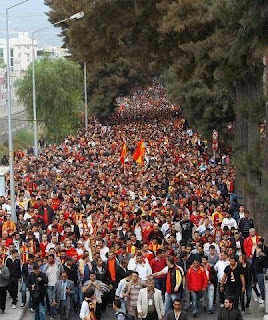 Thousands of militant fans of Istanbul’s three rival soccer clubs led by the left-wing, most politicized of the support groups Carsi, the ultras’ of Besiktas JK, joined forces for the first time in 30 years as they march to Taksim Square. So did rival soccer fans in other cities. Comparisons between Taksim and Cairo’s Tahrir Square that has come to symbolize the ability of the street to topple a government are tempting. To be sure, there are superficial similarities but these are outstripped by the differences. The two square share the unification of rival soccer fans with a history of fighting one another; the occupation of a main city square; the protesters’ slogan: Erdogan, istifa! or Erdogan resign in imitation of Egypt’s Mubarak irhal! or Mubarak leave! ; the violent police crackdown; and the ultimate at least partial government backdown. But unlike mass demonstrations that toppled leaders in North African nations, the protests in Turkey are against a democratically elected leader who has won three elections with a respectable majority, presided over a period of significant economic growth and repositioned his country as a regional power with global ambitions. They also occurred in contrast to Arab countries in a country that despite all its warts is democratic and has a strongly developed, vociferous civil society. The Taksim protests in the week that Istanbul celebrated its capture by the Ottomans 560 years ago have sent Mr. Erdogan an unambigious message: discontent with the prime minister’s authoritarian streak, the Turkish government’s support of Sunni Muslim rebels in Syria, increasing government control of large chunks of the media and attempts to stifle independent reporting and commentary, and suspicion that he is attempting to Islamize public life is mounting. The protests constitute a warning that maintenance of his style of government could as yet turn Taksim into Tahrir. A decision by the diverse, uncoordinated groups that came together on Taksim not to occupy the square and build a semi-permanent tent camp to press their demands for reversal of their demands for preservation of the park that is to be replaced by a shopping mall, an apology by the police for its heavy handed use of force and resignation of the Erdogan government has taken the wind out of the protests. The momentum has temporarily shifted in favor of Mr. Erdogan but to retain it Turks will have to see a real change in his style of governing. Mr. Erdogan benefits from the fact that with no soccer league matches scheduled for the foreseeable future, stadiums, a traditional protest venue in a soccer-crazy country, militant soccer fans are deprived of their natural organizing grounds. 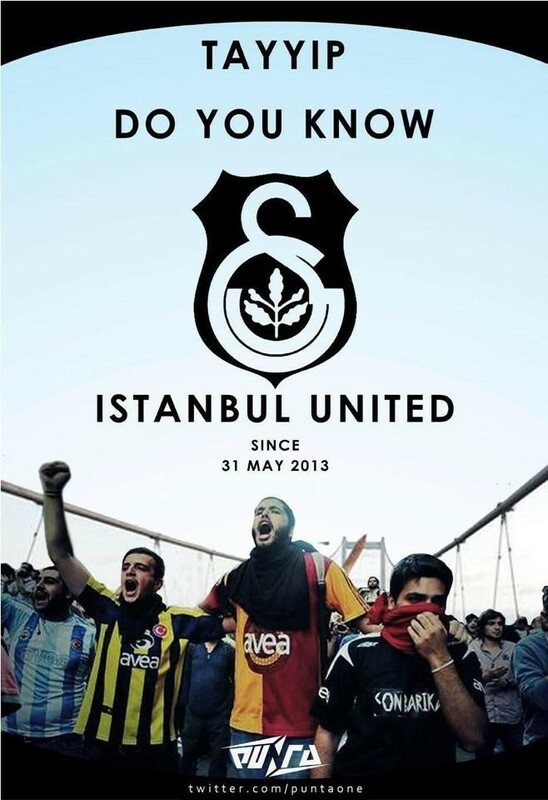 Despite this, major questions remain that need to be addressed and answered to prevent soccer fans and thousands of others from returning to Taksim and other city squares across Turkey. Will Mr. Erdogan back off his plans to redevelop Taksim that has already led to the shutting down of the square’s historic bakery, Inci Pastanesi, and its iconic Emek Theater? Mr. Erdogan responded to this week’s Gezi Part protest by saying the government would push ahead with its Gezi Park plan “no matter what they do.” The prime minister warned that he could put 100 people on the street for every anti-government protester. For much of the week, events on Taksim and in other Turkish cities were underrreported in much of the media in Turkey, which ranks high on the list of media-unfriendly countries according to the number of incarcerated journalists. The government strengthened in May its grip on the media with its takeover from financially troubled Cukurova holding television stations and Digiturk pay-tv. The underreporting was allegedly after government phone calls to various media. The explosion of discontent allowed secularists with the opposition Republican People’s Party (CHP) in the lead to turn the protests into alleged Islamization of society. Secularists point to this month’s new restriction on the sale and consumption of alcohol and the naming of a third, controversial Istanbul bridge that spans the Bosporus as the Yavuz Sultan Selim or Selim the Grim Bridge in honor of the Ottoman sultan widely blamed for the massacre of Alevis in the early 16th century. Alevis, accounting for an estimated 20 percent of the population, although distinct from Syrian President Bashar al-Assad’s Alawite community see Mr. Erdogan’s support for Syria’s Sunni Muslim rebels has further disregard of their concerns and have tapped into widespread popular dislike of the government’s anti-Bashar policy. An interior ministry investigation into the police’s crackdown on Taksim ordered by Mr. Erdogan will also have to clarify whether the crackdown reflected the split between the prime minister and Fethullalh Gulen, who is also opposed to unrestricted Turkish support for the Syrian rebels. Mr. Gulen, a powerful, self-exiled, Pennsylvania-based cleric, is believed to wield considerable influence within the police force. The two men have clashed in the past year over measures to prevent match-fixing after Turkey was rocked by a major match-fixing scandal. Mr. Erdogan defeated Mr. Gulen’s attempts to ensure harsh penalties which would have weakened the prime minister’s grip and potentially strengthened the clerics influence in Fenerbahce FC, which has a fan base of millions. “Erdogan is smarter than the Egyptians. He lets people demonstrate. He caters to the rights of the religious and the Kurds to garner votes and ignores the secularists. The fans are largely secular. This week’s demonstrations have shown that one can stand against the government and that soccer fans can work together. Things will settle for a few weeks. 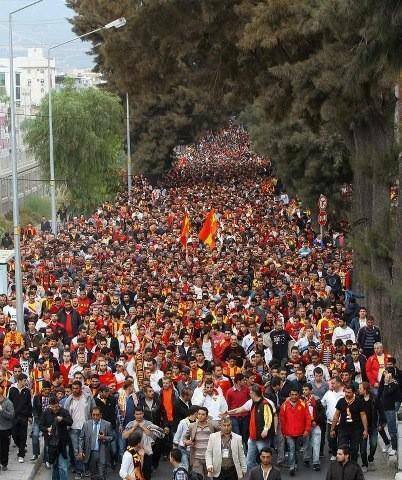 But Erdogan is on notice,” said a soccer fan as he marched against the government in Izmir.